Which should make for some pretty interesting non-political decision making now that climate scientists have declared that there has been no global warming in the past 15 years, and we seem to actually be entering a new mini-Ice Age owing to a downturn in solar activity. Some scientists believe that we're in for colder temperatures, shorter growing seasons, and harsher winters for the next half-century or more. 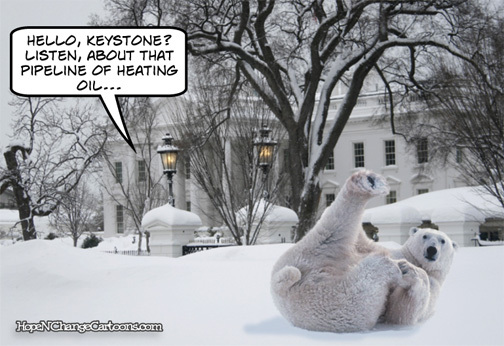 But he continues to dump large quantities of taxpayer money into "green" technologies which will keep us all toasty and warm, if any of them ever prove to work before we freeze to death. Oh sure, the president's gamble with Solyndra went belly up in a hurry, but fortunately he'd also had the foresight to invest our tax money in Evergreen Energy - which remained robustly healthy until they'd finished spending our cash and went out of business last week. But with an eye towards the future, Mr. Obama had also funneled our money into a company called Ener1, which very-profitably made batteries for electric cars like the Government Motors Exploding Chevy Volt...until they declared bankruptcy last week. Of course, the president's high-tech green energy investments haven't all gone bankrupt. Amonix Inc - yet another maker of solar panels - announced that thanks to $5.9 million in stimulus funds, they were able to keep their doors open for a full seven months before laying off two thirds of their workforce last week. With all of these shutdowns and breakdowns last week, you'd think the president would have said something in his State of the Union speech about green energy. And in fact, he did - recommitting himself to dumping billions more of our tax dollars into wind and solar research in order to create energy sources which will not cause the Earth to warm. No matter how much we'll want them to.